It’s time for another Addicted to Stamps & More Challenge…today it’s a CAS challenge. Haven’t played with my Gelatos for a while, so thought it was time. Three different colors were scribbled on my craft mat and lightly misted with water. Then, using a small paint brush, I picked up the colors and dotted them on my flowers and leaves, just sort of randomly. Next comes a liberal dose of Wink of Stella for some real sparkle, a stamped sentiment and a smattering of sequins. And for something different, I layered it over a colored card base for a change. Beautiful – I like the bold sentiment in contrast to the delicate flowers! Gorgeous card Lee-Anne! I really like the soft colors you used on this card. 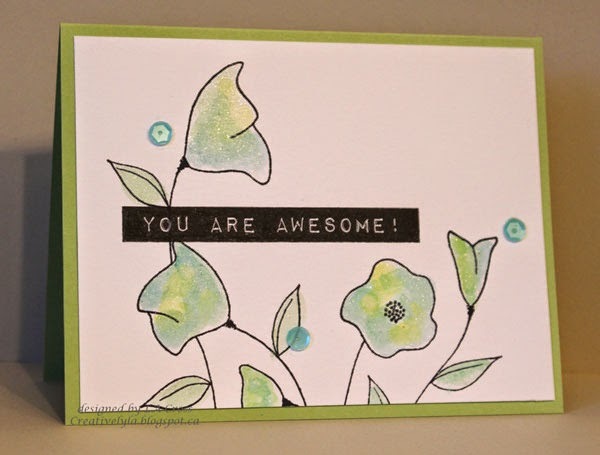 When I saw this card on the DT blog, I couldn't wait to see it up close…Your water coloring is absolutely stunning on your flowers and leaves, and I love how you added sparkle with your WOS marker! Gorgeous card, Lee-Anne! What a gorgeous mix of colours and the added sparkle is just perfect. This is CAS perfection!! LeeAnne – I'm swooning over how beautiful and delicate your card is! Those flowers, shimmering with sparkle, are ever so pretty! I agree with Kylie: the coloured card-stock sure adds impact! WOW! This is simply gorgeous. I love, love the sparkle. I love the way you have colored your flowers with the gelatos. So pretty! The colors you used really blend nicely together. This is such a beauty 🙂 I love the subtle look of the flowers ! Beautiful combination of stamps. And you obviously get along better with your Gelatos than I do – must try watercoloring with them. This is outstanding! Love it! Such a pretty design, Lee-Anne! Love the colors and the shine! Previous Previous post: Belated Happy Birthday, Darnell!